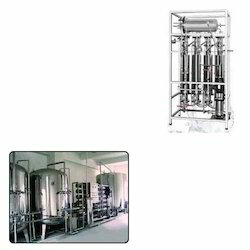 Providing you the best range of multi column distillation plant for water distillation with effective & timely delivery. We are engaged in offering a vast array of Multi Column Distillation Plant for Water Distillation to our sophisticated clients. These quality product range are known by their high performance and high productivity. Our products are as per industry standards and quality parameters. All wetted path art made from AISI 316L stainless steel and rest are made of AISI 304 stainless steel.